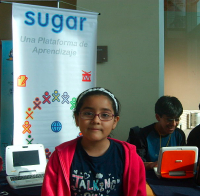 Sugar was presented in Santiago as part of the Free Software events that were done locally in many parts of the world on October 7-9, on equal footing as, for example, Ubuntu, who were on the very next booth. The credibility the Sugar people in Chile have is first rate. Of course, they could do even more if they got some help from OLPC, but their grassroots work remains definitely the best I've ever seen as to message, ability to reach, honesty and openness in sharing the ups and downs. As we know how hard it is for us to open doors for our proposals, they are right in already, a respected part among those who have something good to share. And to help beyond their borough: the guy in the background of the photo is a volunteer from Bolivia. During this event they presented 4 Classmate running SoaS (Sugar on a Stick) and 2 XO for people to try them out. Werner Westermann presented a conference, and of course the Acevedo clan, with Patito, Franco and Amaya were in the thick of things.